discovering what it cares about. What Does ALUUC Mean to You? Maybe it’s the inspiration of a Sunday Service, the warm fellowship of a potluck, the encouragement of your children to think freely by attending Children’s RE classes, or the opportunity to make a difference in our community and the world through social justice work. 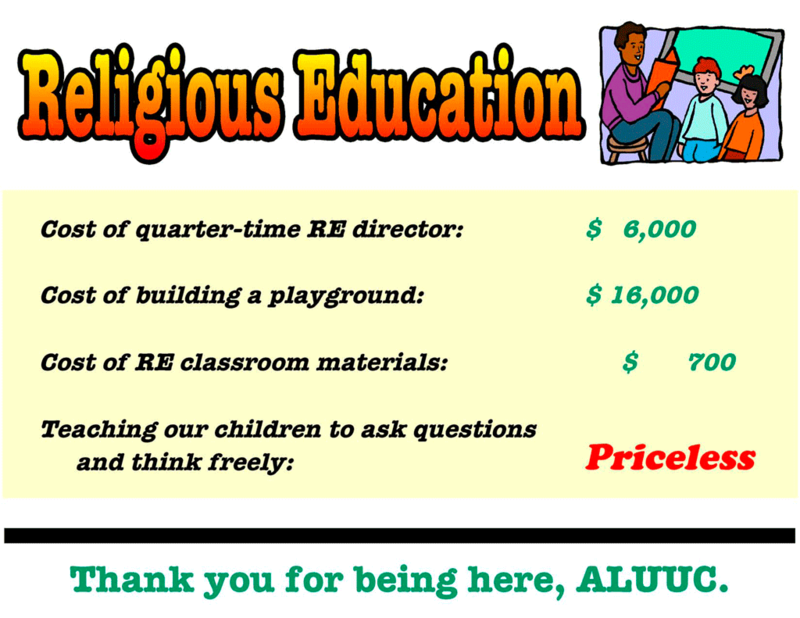 Now more than ever, ALUUC needs to remain strong, striving toward our mission to “serve as a visible example of a tolerant religious community.” As a welcoming congregation, we play a vital role in the lives of many who come to us in their search for acceptance, spiritual fulfillment, and intellectual stimulation. Dedicated to social justice and growth for individuals of all ages, we are truly a light in the world. A significant financial contribution consistent with the ability to pay is one of the responsibilities of church membership, and we ask every member family to make and keep a financial pledge to the church. 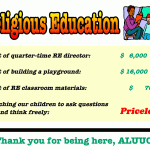 The church benefits by having a broader base of support for our programs and services and by having more members with a financial stake in ALUUC. Only you can decide what ALUUC means to you and how much you want to contribute to keep our community strong and growing. We are grateful for all contributions regardless of the amount. We are particularly grateful for the strong and loyal support shown by members and friends who have contributed to the growth and development of ALUUC since its founding in 1953.
boost our self-image, and make us feel secure. What do you find priceless at ALUUC? Why does the congregation need money? UU churches run on a congregational model in which every congregation sets its own budget and priorities and is responsible for raising the money to carry out its ministry and mission. We do not receive funds from the Unitarian Universalist Association. The primary source of funding is the annual stewardship — or pledge — drive. Annual pledges make up over 80% of the operating budget, and more in some congregations. Other sources of revenue such as the Trash & Treasure Sale, Fantasy Auction, plate collection, and building rental fees supplement pledge income. Every spring we conduct the annual stewardship drive with all members and friends. Throughout the year we ask new members to make a pledge to financially support the church. A pledge is an annual commitment to support the congregation with a monetary contribution—an estimate of the amount you plan to give during the church’s next fiscal year (July 1 – June 30). While there is an expectation that you will pay the amount pledged, it is not a binding obligation. If your financial circumstances change, you can notify the Treasurer or any Board member that you will not be able to fully meet your pledge. Rather than pledging can I just make a weekly contribution? You can do that if you wish, but it would be better for the congregation if you totaled the amount you are planning to give and completed a pledge card. If you prefer to call it a contribution rather than a pledge, that is perfectly acceptable. Pledging, either during the annual pledge drive or when you join the congregation, provides funds for our congregation to be here for us and as a beacon of acceptance and openness in our community and in the world. By pledging and paying, you help the church plan its budget, income and expenses for the coming fiscal year and ensure that the heat stays on, salaries are paid and coffee flows freely on Sunday morning. There are five major components of the church budget: denominational dues, the minister, the building & facilities, religious education, and other expenses including committee budgets, the membership coordinator & office manager, accounting services, musician services, and office supplies and postage. 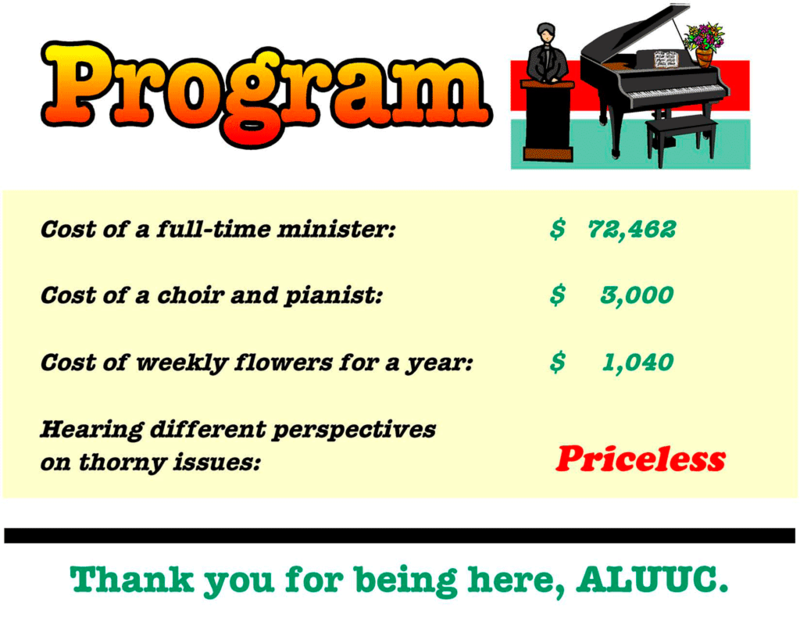 A successful stewardship program allows our church community to maintain its programs and advance its mission, and keeps ALUUC here for all of us! Why should I pledge if I put money in the collection plate every time I come to church? To provide ongoing programs, we need to have predictable income. Our expenses for salaries and utilities continue regardless of Sunday attendance. We cannot adequately budget based on fluctuating collection plate contributions. I teach in the religious education program and my husband is on a committee. Those are real commitments. Shouldn’t they count as our contributions? Your commitments of time and energy are valued and appreciated. We do need volunteer time to run the congregation, but the reality is that we need money also. We have a budget to maintain and the only significant source of funding is from our current members and friends. Most of the congregation contributes time to the programs of the church as you do and they make a financial pledge as well. 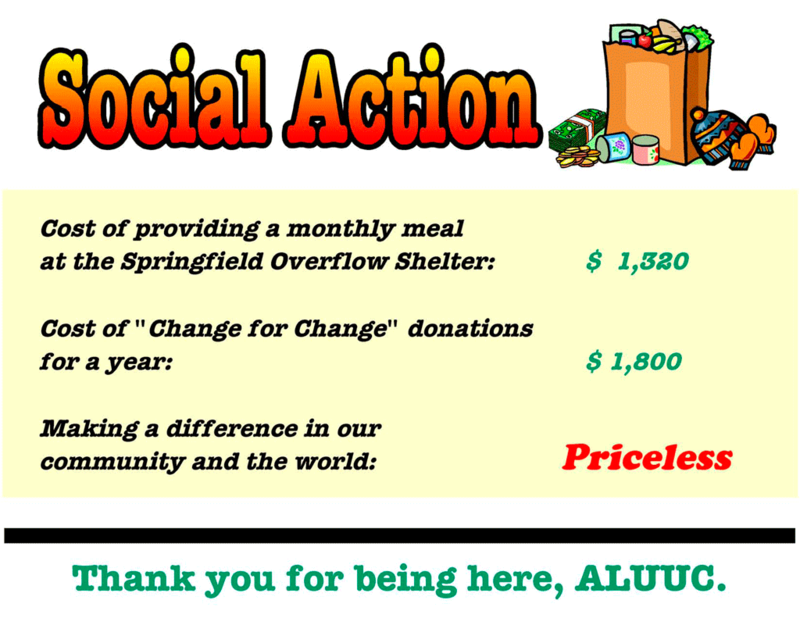 They are compelled by the value they receive from the ALUUC community. To be good stewards of our congregation we have to contribute both our time and money to the extent we are able. You can pay your pledge weekly, monthly, quarterly, or in one lump sum payment. Most people simply put their pledge checks in the collection plate at Sunday services, or mail them to the church office. Occasionally we receive gifts of appreciated stock, which give significant tax benefits to the donor. The Treasurer can help advise you on these options. The Office Manager keeps a record of all pledges and contributions paid by check or by cash in a collection envelope with a name on it. You will receive a statement of your pledge payments at the end of the calendar year and at least once during the church year. I am unsure how much is appropriate. Can you explain this to me? You should select the level in which you feel comfortable, whether according to ALUUC’s model or the UUA’s model. We also suggest that you make a commitment to move toward the suggested Fair Share level over time. 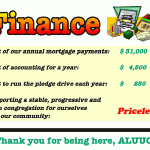 The average annual pledge at ALUUC is $1420 (2010‐2011 data.) Since some of our members are either early or late in their earning careers, they may contribute less. That means that those who can afford it contribute more. One purpose of a spiritual community is to help those in more limited circumstances. But I’ve been pledging and contributing for years. Doesn’t that count for something? Each pledge is important. However, the truth is that some of us promise as much as we are able, while others have yet to lift their giving to match the value of the church to them. 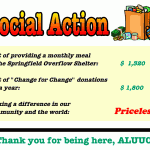 Increasing a pledge each year mirrors the increasing importance we feel about our community of people and programs at ALUUC. What will my pledge pay for? 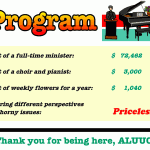 ALUUC is a healthy community of over 200 adult members. Our annual budget is approaching $200,000, including mortgage payments. 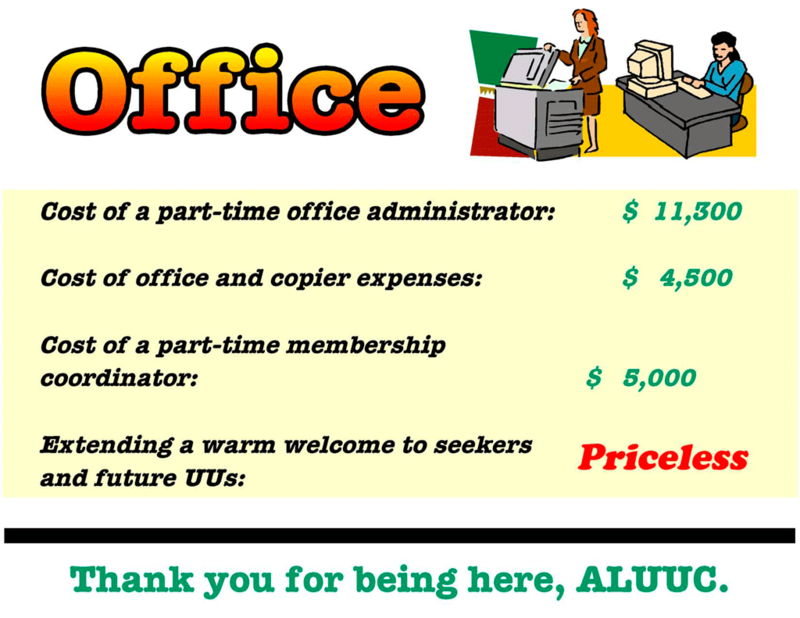 This means it costs over $1000 per individual member to open ALUUC’s doors and more than $2000 for a family of two adult members. The charts in the Stewardship brochure show a breakdown of annual expenses. What if my circumstance change and I can not keep my pledge? Should a major change occur in your financial status, you may adjust your pledge during the church year by notifying the Treasurer or any board member. We care about your situation and this is entirely your decision. What are the tax advantages of pledging? Church contributions are tax deductible as long as you itemize your taxes. If you are making a sizable pledge it may be to your advantage from a tax standpoint to transfer an asset such as a stock or mutual fund to the church. By doing so you receive the charitable deduction for the value of the asset transferred, and you do not have to pay capital gains tax either. The Treasurer can provide you with the details of how to make the transfer. 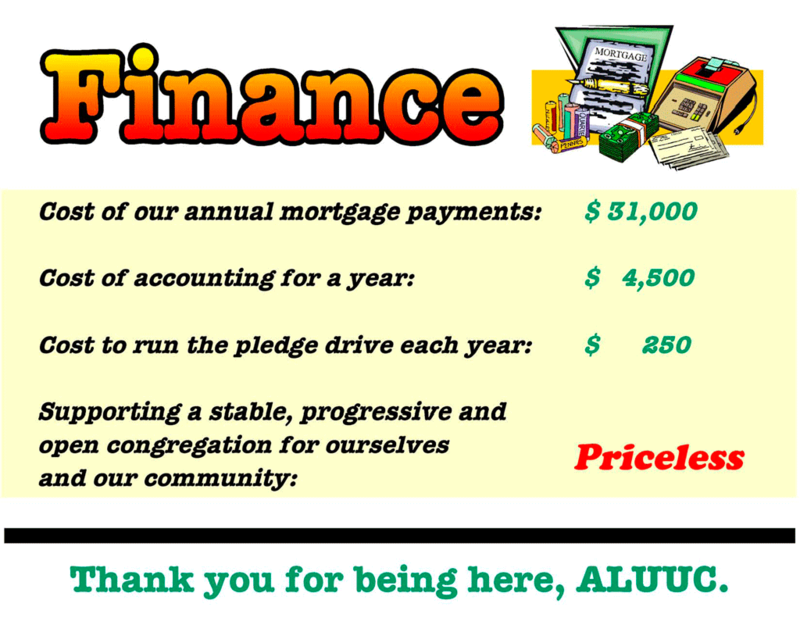 Now it’s easy to support ALUUC financially without spending an extra penny.